From my very first days as a Saturday boy in a French polishing shop I've always kept a box of tricks under the bench ready to take on site. This latest Systainer from Festool is quite the flying kit if you work away from your bench or lean towards mild OCD when it comes to getting your hands sticky. Applying oil finishes by hand can be a messy process so anything that gets round this is a must for me. 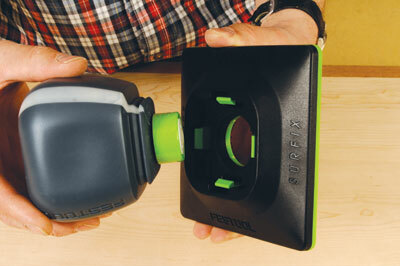 It's worth acknowledging at this point that the Surfix box is a finishing system designed to make good use of Festool's Rotex random orbital sander. The Rotex is by no means essential, as practically any random orbital would do, but if you've bought into the system the Surfix is an ideal bolt-on. My bench top was in need of a makeover when the kit arrived so I wasted little time getting to know the product. The Rotex has been around for a while and has a proven track record so is not the focus of this review. Having previously removed the acrylic varnish to reveal the maple substrate I worked up from the 180grit to the 240grit disk supplied to prepare the surface for a finish. I opted for the Heavy Duty oil and placed it into the dispensing pad with the non-drip nozzle fitted and attached the hook and loop sponge pad. A little squeeze (and I mean a little squeeze) and I was off and running. The 0.3L bottle doubles up as a handgrip to make spreading the oil very easy indeed. If you're new to oils I should point out that a little goes a long way and this method of application allows the control you need to avoid wasting too much product. 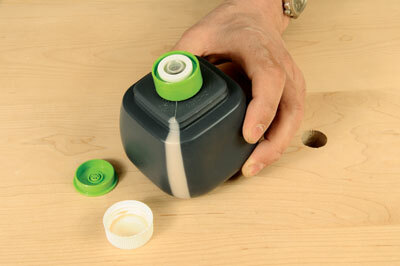 On larger areas a light squeeze of the reservoir releases a drop of oil so no more recharging brushes or dripping rags. So far I had avoided getting my hands dirty and was wishing I had a bigger bench. With a fine even coat applied it was back to the Rotex fitted with the first of the abrasive pads. Running slow the pad was used to work the oil into the surface of the maple leaving just a slight trace of a scratch pattern. In under an hour the surface was flat and even and just a bit tacky. It's quite possible that for some surfaces one coat would be sufficient but I was in one of those belt and braces moods and decided to re-coat again the following day. Although the abrasive pad had to be thrown away, the sponge pad was still ok to use after being put back in the metal container over night. The second application was applied and buffed, this time with the finer of the two pads to give a really good finish. And as my old governor use to say, "If a fly lands on that he'll break his bloody neck". Heavy Duty. 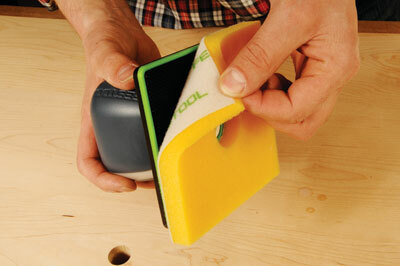 For use internally on all wooden surfaces where a high level of use is expected. Solvent free and suitable for kitchen worktops, floors and toys. Solvent free and water resistant. One-step. For decorative use internally, less hard wearing. Oil/wax mix and solvent free, suitable for use on wardrobes, shelving and other living room furniture. Easily repaired. Outdoor. Suitable for use on all outdoor timber. Provides UV protection and resists fungal infection. 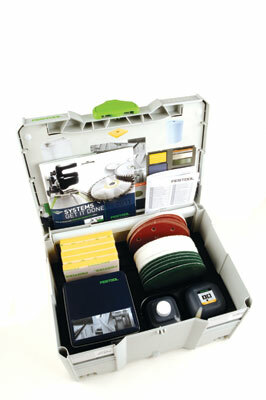 As a kit the choice of oils and abrasives is perfectly adequate for most uses. I see no reason why other oils could not be used with it and Festool may well increase their range in time. As a system it works for me, appealing to my need to have a place for everything and everything in its place but there are practical advantages that far out way any tendency for obsessive behaviour. There are no screwed up rags to spontaneously combust. There is no leftover product in a jar, likely to be contaminated, to be tipped back into the tin and no brushes to clean. The pad application system is obviously not suitable for smaller items and just like a paint roller it holds a fair amount of product so run it dry to avoid waste. Use it on large areas and you will undoubtedly save time.